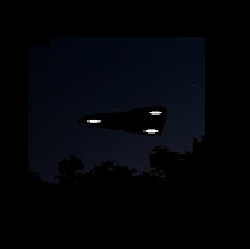 We have a lot of Black Triangle UFO Resources at 4UFOs.com. Video Truth about Aurora Hypersonic Jet at the bottom of this page. I saw a dark gray tear drop shaped object high up. It was stationary. The light turned green, I drove south on Wyoming looking up a few times, noting the object didn’t move. I stayed in the far left lane, again was the first vehicle at the next intersection, Wyoming/Zuni; the light was red. I looked up to find that the object had changed shape. It now looked like an elongated diamond, flat white-gray in color. The surface was a blank, no windows or rotors. I thought it could be a helicopter until I noticed that it was featureless. I kept my eye on it. When the stop light turned green, I looked up as I drove south on Wyoming. The object changed shape again. I was stunned. It now looked like a stubby triangle, same flat white-gray color with three large round lights. The lights looked like faded heat lamps in color except the light emitted was intense and more white in the center. The object remained stationary. I kept my eye on it as I drove. I looked around at the drivers around me, no one appeared to notice this huge object. I looked at the buildings to the left of me and looked up, they were dwarfed by the object’s size. I thought the object was hovering near until i saw a military jet fly under it. The jet had a contrail, I thought it had taken off from the base by its angle of ascent. I was very close to the base gates at this time. The jet was the the size of one of the triangular corners on the object. The object was clear. I could see it as if I could reach out and touch it. I pulled into a Chevron station located near the Kirtland base gates. I could see the object until I got out of my vehicle and looked up. It was gone. Coincidence? There were several jets crisscrossing the sky for the next hour. I felt no fear, only disbelief. I am grounded in science and a UFO skeptic. Could this be military? It had to ascend somewhere near or from ground level on base. It was always in front of me as I drove South. Editor's Note: I am extremely impressed with this Triangle UFO Sighting, as the Report is clear and detailed. You can also really get a sense of the Witness's state of mind. He seems genuinely surprised to discover that there really are unknown objects in our skies. Well, I enjoy blogging and keeping up with this site, and I hope that one day it will pay for itself and maybe even provide some for me, but I wouldn't be interested if there weren't huge Truths associated with the UFO Phenomenon. The problem is, of course, the high amount of faked images and footage that is spread about every day. Regardless, that doesn't change the fact that there are still very real objects in the skies all the time:. You just have to start looking up to notice them. In this case: I think the Black Triangle was probably not one from the USAF - but I couldn't be sure. What many call the Aurora is said to somewhat resemble the first shape he described, but I have never heard of it changing shape or modifying itself, and the stealth plane technology that the US Military is currently using may be capable of refracting all electromagnetic energy (from radio waves to gamma radiation), but I did not find any evidence of patents or citations for "morphing" technology. That's foreign and, perhaps, alien. Online Fundraising is easier than you think. Saw what we thought was a shooting star this evening over Lake Conroe, 7/12/14 around 8:40 pm, while fishing on dock in Walden. Called out to my husband and he saw it also. Looked like a white point with 2 white points behind, like a skinny jellyfish. Not a shooting star. I thought it might be a drone. He said it looked more like a missile. Disappeared shortly after.